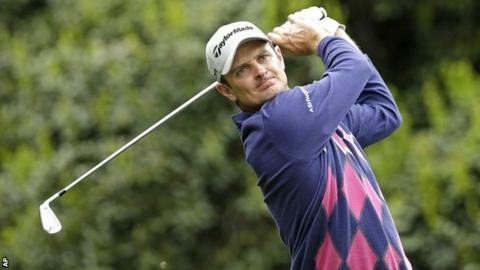 England's Justin Rose carded a five-under 67 to move within one shot of the lead at the halfway stage of the Wells Fargo Championship in North Carolina. The world number 10 chipped in from 70 feet for an eagle and made four birdies to reach eight-under-par for the event. Martin Flores leads with Angel Cabrera but Phil Mickelson is seven back after a 75 and Rory McIlroy only made the cut by a shot after a 76 left him one over. Lee Westwood and Jamie Donaldson were among the players to miss the cut. McIlroy won the event at Quail Hollow in 2010 for his first PGA title, but dropped five shots in three holes from the second on Friday. "At least I made it through to the weekend," said the 24-year-old after his worst score at the course. World number nine Mickelson, the highest ranked player in the field, was only one behind first day leader Cabrera after an opening 67 but made three bogeys on each nine and took 34 putts in round two. "I can't believe the difference in putting from yesterday to today," the Open champion said. "Yesterday I saw every ball go in the hole and today I couldn't get them to fall, which is funny because the greens were so perfect." Rose, who tied for 14th at the Masters last month, shared eighth last week in New Orleans and is finding form after being hampered by a shoulder injury that kept him sidelined for the first six weeks of the year. "Obviously you can never win it on Thursday and Friday, you can only lose it, so two solid days put me in good position for the weekend," said the 33-year-old, who has not won since his US Open triumph last June. American Flores, 32, seeking his maiden PGA title, has had four top-20 finishes in his past six US tour starts and started from the 10th hole with a birdie and an eagle, holing a 105-yard fairway shot at the 11th. Cabrera, who has never before led after consecutive rounds in his PGA career, has made only two cuts in 10 tournaments this year, faring no better than 43rd, and this is his first start since missing the cut at Augusta last month. The 44-year-old Argentinian has not won a title on the US tour other than his major triumphs at the 2007 US Open and the 2009 Masters, his best non-major showing a third place at this event in 2010. Starting on the back nine, Cabrera opened with a 23-foot birdie putt at the par-5 10th and made four birdies in five holes on his inward nine. Westwood, who captured the Malaysian Open by seven shots last month, has not won on the PGA Tour since 2010 and had three double bogeys in his 76.